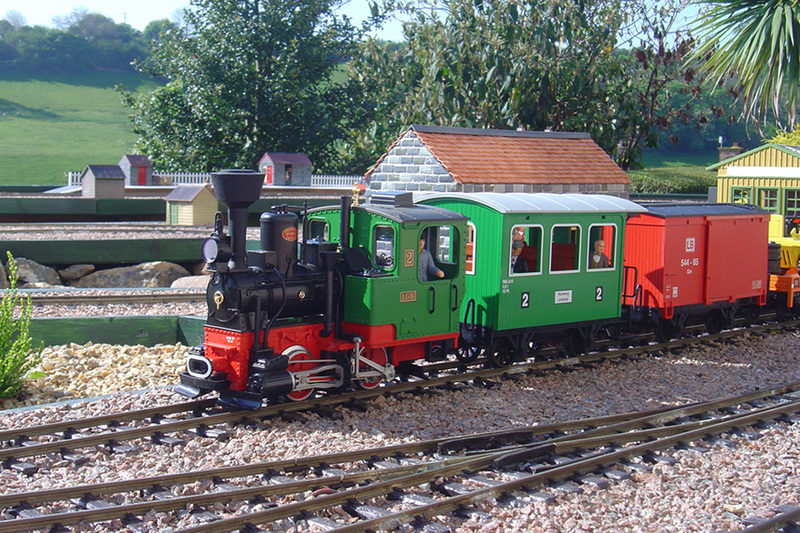 Considered by many to be the finest 7¼ inch gauge railway in Britain, the Beer Heights Light Railway (BHLR) first opened to the public on the 14 July 1975. 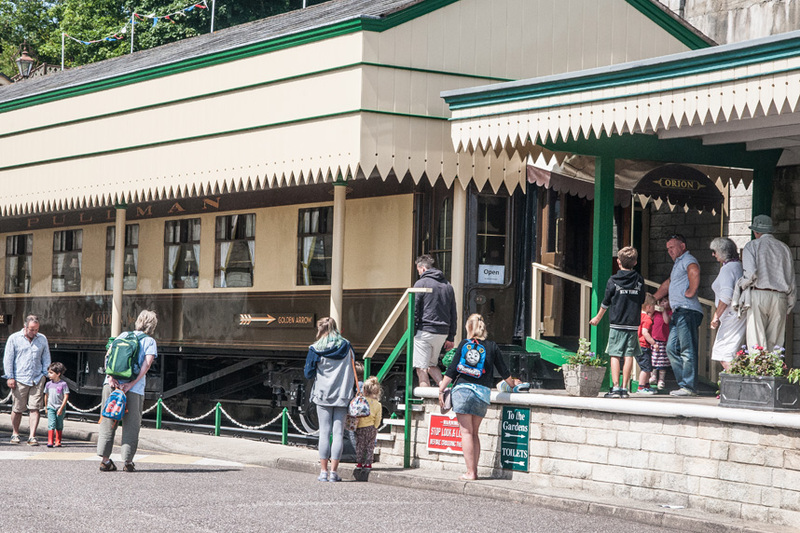 Given the location of Pecorama, high on the hillside above the village of Beer, a ride on the railway offers wonderful views over Lyme Bay and along the Jurassic Coast, a UNESCO World Heritage Site, to the distant Portland Bill. Having been gradually extended over the years, the line forms a complex, convoluted circuit now one mile in length. Passenger trains start and finish at the terminus of Much Natter Station, just inside the main Garden entrance. 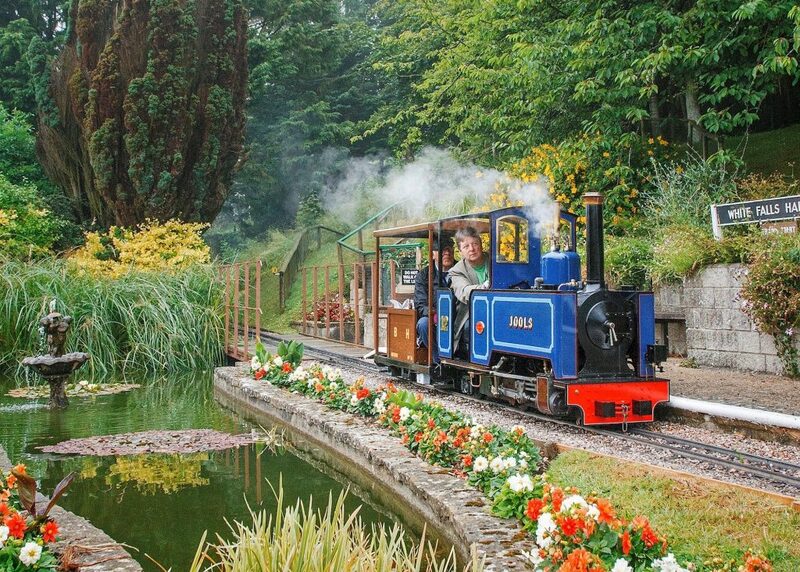 The route starts off through the formal gardens, includes many bridges, extensive sidings and a lengthy tunnel. Following this, the train seems to go out into the countryside and passes the new Deepwater station. Here passengers may choose to alight to enjoy the tranquillity of Lake Charlotte, the beautiful wildlife pond in Wildway Park, where there is also a nature walk and fitness trail. The train then passes a branch line which zig-zags down very steep gradients to the Beer Mine. At the very busiest times, train services can involve running up to three passenger trains and four locomotives at once. Smooth and safe operation is assured by the fully automatic, fail-safe signalling system which utilises both colour light and traditional semaphore signals. 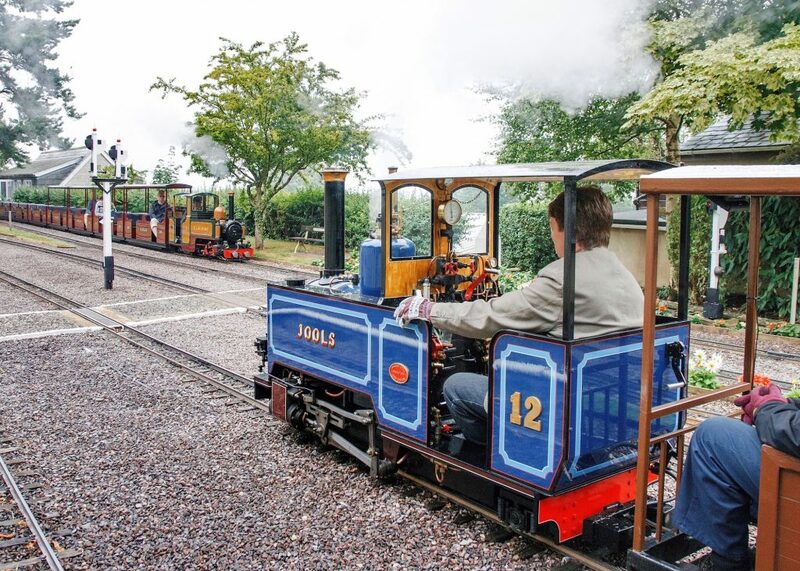 Much of the railway’s extensive fleet of locomotives and rolling stock is based on British narrow gauge railway practice such as the well-known ‘Great Little Trains of Wales’, but one-third of the size! On a beautifully sunny day at the end of June 2018, the most recent member of the BHLR fleet was officially named ‘Jools‘ by music legend and railway enthusiast Jools Holland. 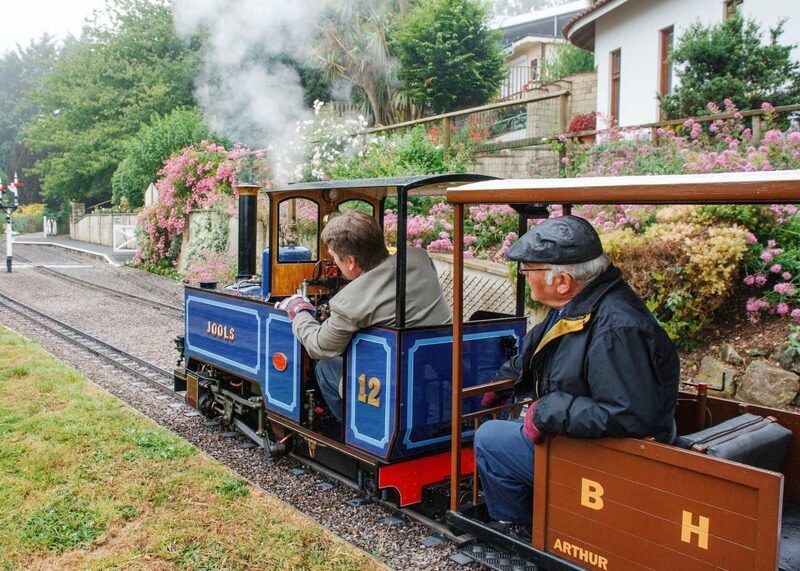 A great opportunity to enjoy the thrill of preparing, firing and driving a steam locomotive, on the award-winning Beer Heights Light Railway, our mile-long scenic, fully signalled narrow gauge railway at Pecorama, in glorious Devon. Our Steam Locomotive Driver Experience Courses offer you the chance to have the footplate all to yourself, whilst benefitting from expert tuition and supervision from our highly experienced staff. Participants are welcome to bring up to two guests who will benefit from entry to Pecorama. 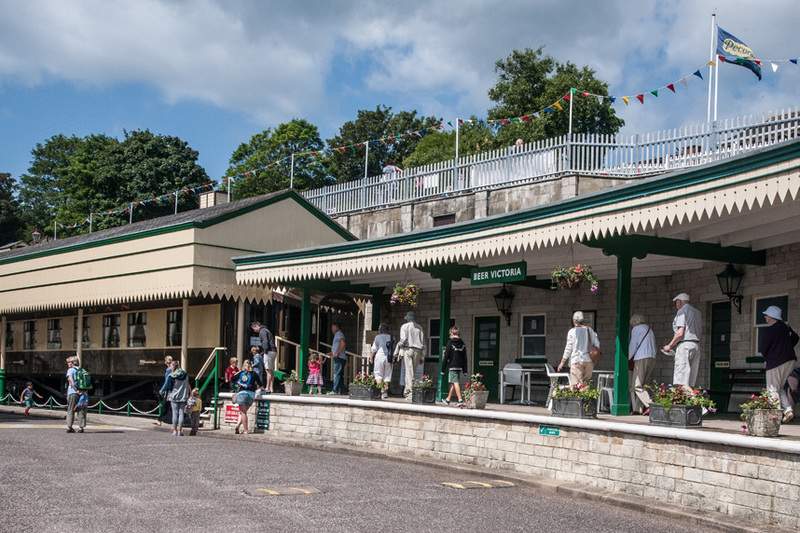 This includes the Model Railway Exhibition, Glorious Gardens with stunning views over Lyme Bay and unlimited rides on the Beer Heights Light Railway. 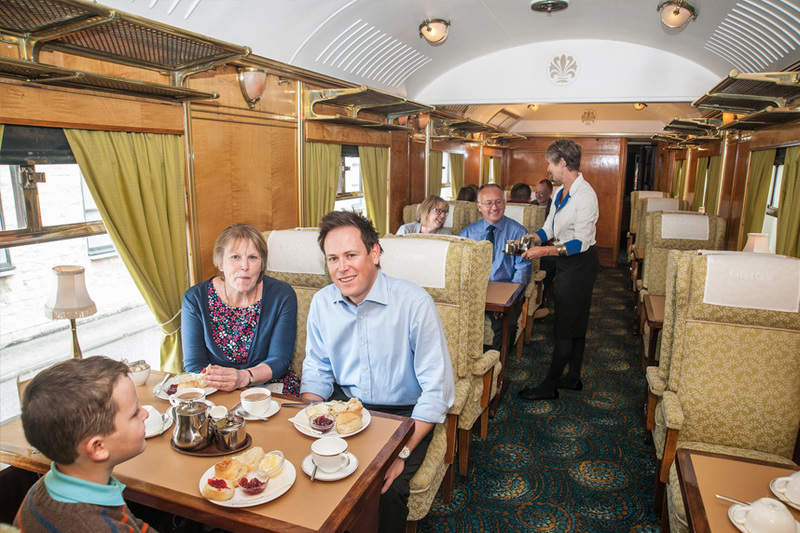 9.30am Meet your instructor and receive a safety briefing and theory session (with tea and cake) in the splendour of our restored Pullman Coach “Orion”. After that you will prepare, learn the controls and steam up the engine. Before lunch there should be an opportunity to drive the engine with full guidance and advice from your instructor, who sits behind you with “dual controls” – just in case. Enjoy a lunch in our Garden Room Restaurant from about 12.45 – 1.35. After lunch you should be coupling up to a set of coaches and Driving several trips on the “mainline”. Finally, there is ‘disposal’, how to clean up and leave your locomotive safe for the night. £215 (all courses are conducted on a one to one basis). Price includes all refreshments throughout the day and a personalised certificate to commemorate your day as a driver. Is there an age limit? Yes, participants must be 18 years or over. When are the courses available? Courses are available on Wednesdays in May, June, July, September and October. Please contact us for available dates. Do I need any special clothing? Cotton overalls are essential to protect your clothing, along with stout boots – safety type are preferable. A waterproof jacket is also required. Suitable gloves will be provided. Can I book on behalf of someone else? Yes, this course makes an ideal gift. How physically demanding is the course? Participants need to possess a reasonable degree of physical and mental agility and to be able to comply with both verbal and graphic instruction. However, we cannot make assumptions or judgements about a person’s abilities without being informed of their circumstances and needs. How do I book? Please contact us on 01297 21542 and ask for the Tourism Office. 50% deposit payable on booking. Balance to be paid no later than 14 days prior to course date. 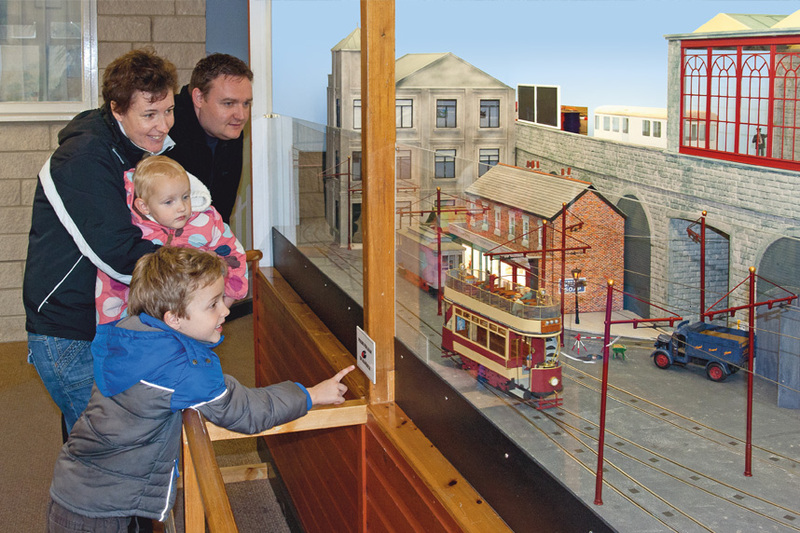 As you enter Pecorama, the Model Railway Exhibition and Model Shop welcome you to the home of the famous PECO brand of model railways, one of the last major model railway production facilities left in the UK. The factory, alongside Pecorama, produces a countless variety of items for the enthusiast every day, utilising modern specialist machinery with highly skilled local labour. Since railways fascinate many adults and children alike, it is not surprising that such a large number of homes already have a model railway. Some enthusiasts are deterred from the hobby in the belief that they would need more space. 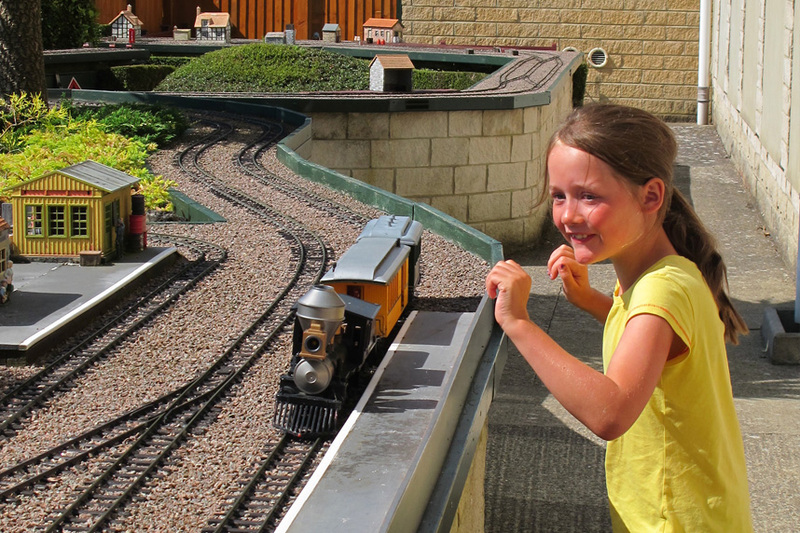 However, our Model Railway Exhibition aims to inspire modellers by demonstrating a variety of practical small layouts to suit every home – with options for both indoors and out. All boast an impressive amount of detail and even those who don’t model will marvel at the craftwork involved. Many of the layouts have interactive features. Don’t miss the chance to play the free quiz during the school holidays. A selection of multiple-choice questions, all related to the layouts, will keep families entertained as they take in the exhibition. There are no trick questions, but keen eyed observation is essential if you want to be in the prize draw hat. New in the Exhibition for 2019! Our talented team in the Model Railway Exhibition have been working on designing a new fun theme park layout, which will be completed just in time for the start of the main season. The brand new layout will feature dinosaurs, skiers, spaceships, fairground rides and even a working volcano. We’ve recently installed a new overhead railway line, new tracks, the background has been painted and the volcano is getting bigger and better by the day! To register your interest, please contact us either by phone on 01297 21542 or by using our contact form. We will call you back to discuss the course details. A practical introduction to the core aspects of railway modelling, with expert tuition from our very own in-house modellers. 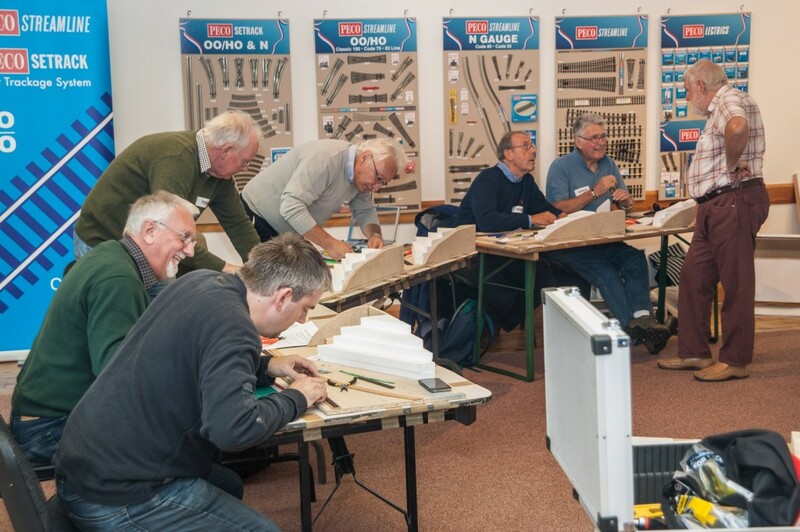 The course will start with a private guided tour of the Pecorama Model Railway Exhibition to illustrate many of the techniques that will be taught. Much of the course will be hands-on, with your tutors assisting and advising you on each aspect. Over the duration of the course each student will learn how to model their own section of baseboard, which can be taken home at the end of the course. Yes, participants should be 18 years or over. Do I need to bring any special clothing and tools? Yes, you will be provided with a short list of necessary items prior to your course. How many participants will there be on each course? There will be a maximum of 12. When are the courses available? As dates become available they will be posted on this page of the website. Yes, this course makes an ideal present. Please ring us on 01297 21542 EXT 261 and ask for Andrew Beard, who will be one of your course tutors. If I have any technical questions who can I speak to? Refunds for cancellations will be considered up to 48 hours prior to the course, where after a maximum of 50% refund may be given. On leaving the Exhibition Hall, you will enter the specialist Model Railway and Book Shop where our staff are at your service to answer queries and show you the extensive range of products by PECO and many other major manufacturers. The current issues of Railway Modeller and Continental Modeller, magazines with the largest circulation in their field, are on sale. For those who are looking for souvenirs to take home or buy for friends, you will find a good selection of traditional small items on sale, including postcards. Standing in the siding at Beer Victoria Station is the beautifully preserved Orion Pullman Car, part of the Golden Arrow train that used to run from Victoria Station, London to the Channel coast. Bought and saved from the scrapheap by Pecorama, Orion was restored by highly skilled craftsmen, at the British Rail Works in Wolverton, where the Royal Train had been maintained. Here the vehicle was repainted in the distinguished umber and cream Pullman livery, reinstating the elaborate lining and coat of arms that adorned these cars in years gone by. The interior, while retaining all the beauty of the original brass decoration and polished woodwork, has been completely refurbished by local craftsmen to include individual seating, an entirely redesigned kitchen and drinks dispensary. 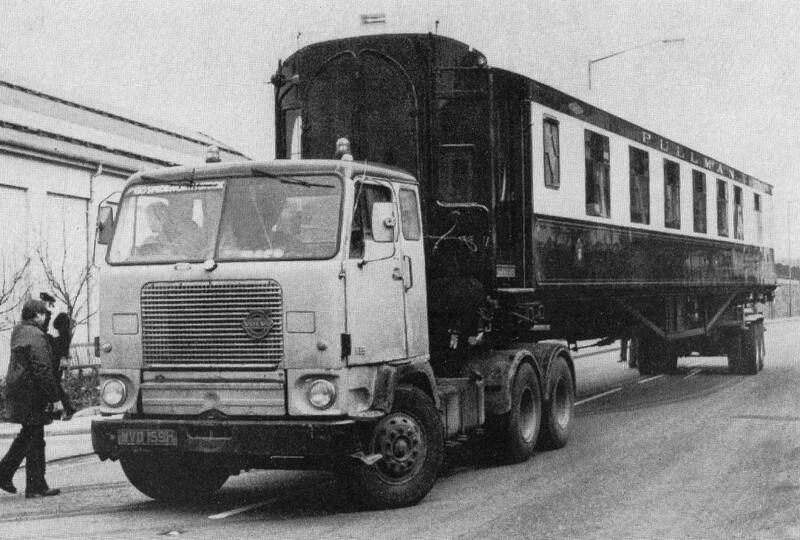 It was in January of 1978 that the 40-ton coach was transported an arduous 250 miles by road to the Pecorama site. It now stands majestically at rest adjoining Beer Victoria, a full-sized replica station platform. The Orion is open in the main summer season 11.00am – 4.30pm serving morning coffee, afternoon teas and a wonderful selection of homemade cakes. As a quiet, peaceful area to enjoy refreshments and indulge in the nostalgia that this environment provides we advise that it is therefore not suitable for very young children. Full catering facilities, including a children’s menu are available in the Garden Room Restaurant. The Orion can also be hired for a variety of uses. Our Pullman Carriage is available for private hire and can provide you with a unique experience at attractive rates to suit your needs. Bespoke programmes can be arranged on request so please contact us for details. Depending on your requirements and the date/time of your event, catering can be in-house or supplied by outside caterers of your own choosing. For a nominal charge, Pecorama can also provide you with an expert to give a talk on either the history of Pecorama and the Beer Heights Light Railway, or a wide variety of other topics. Talks can be entertaining, light-hearted or informative, all tailored to suit your needs. All prices are for guidance only and are not to be taken as a definitive quote for the hire of the car. Pecorama reserves the right to increase or decrease the hire figure depending on the nature of the event being planned.